Both balsamic vinegar and apple cider vinegar are used in Italian cooking and other types of cuisine. You may have wondered if there is any real difference between the two since they are both vinegar. As it turns out, they have significant differences that go beyond their respective colors. This article will explain those differences. Traditional balsamic vinegar is produced exclusively in the cities of Modena and Reggio Emilia in Italy. It is made from the reduction of Trebbiano and Lambrusco grapes that have been pressed together. The reduction then goes through a 12-year aging process where it is placed in successively smaller wooden barrels, which results in an end product that is a dark, sweet and thick liquid. 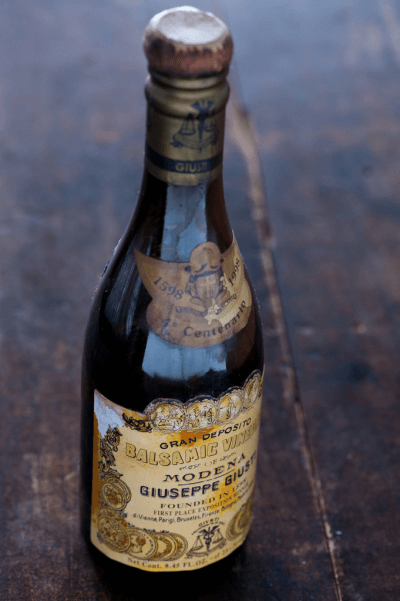 Because of this, traditional balsamic vinegar is often expensive. Many vinegars labelled “balsamic” are made outside of Italy, or aged for less than 12 years. Others have slightly altered proportions of grape juice. In fact, most “balsamic vinegars” available commercially are actually just wine vinegar with added colouring and thickening agents. These agents simulate the color, taste and texture of the traditional product. Apple cider vinegar comes from freshly-squeezed apple must, which is juice that contains bits of pulp and skin from the apple. To create apple cider vinegar, the vinegar-maker adds yeast and other fermenting agents to the apple must. Over time, the sugars in the juice turn into alcohol, and acetic acid-forming bacteria transform the alcohol into vinegar. The acid content gives apple cider vinegar its distinctive tart and sour taste. 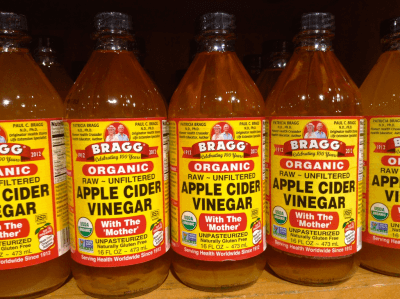 Many brands of apple cider vinegar include a cobweb-like substance called “mother of vinegar” that contains cellulose and acetic acid. While mother of vinegar can make apple cider vinegar appear cloudy, it does not affect the taste of the finished product. Because of the relatively lower cost of apples, apple cider vinegar is cheaper and more readily available than balsamic vinegar. In fact, many home chefs make apple cider vinegar at home, using store-bought organic apples. The main differences between balsamic and apple cider vinegars lie in their tastes, colors, and textures. In turn, these differences lead to chefs using the two types of vinegar differently. Both types of vinegar are sour or slightly acidic, but balsamic vinegar tends to be slightly sweeter. This is because of the higher carbohydrate content found in balsamic vinegar. Apple cider vinegar contains less carbohydrates than balsamic vinegar, which gives apple cider vinegar a more sour, somewhat harsh, taste. Apple cider vinegar tends to be straw-colored because of the natural color of apple juice. In contrast, balsamic vinegar gets its characteristic dark hue from the first step of the process, which is the reduction of pressed grape juice. The vinegar becomes even darker as it ages in wooden barrels. The aging process also gives balsamic vinegar a certain degree of thickness and texture. Due to these differences, balsamic vinegar and apple cider vinegar have different culinary uses. Balsamic vinegar enhances the flavor of steaks, fish, and poultry. It is also a component of certain salad dressings, and is drizzled on fresh fruit such as peaches and strawberries. Some diners even drink traditional balsamic vinegar to finish a meal. Apple cider vinegar is ideal for marinades and is an ingredient in various food preservatives, pickles and chutneys. While many people drink apple cider vinegar, it has a sharp and biting taste that may reduce its appeal to some.